In the last days, God says, I will pour out my Spirit on all people. Your sons and daughters will prophesy, your young men will see visions, your old men will dream dreams. 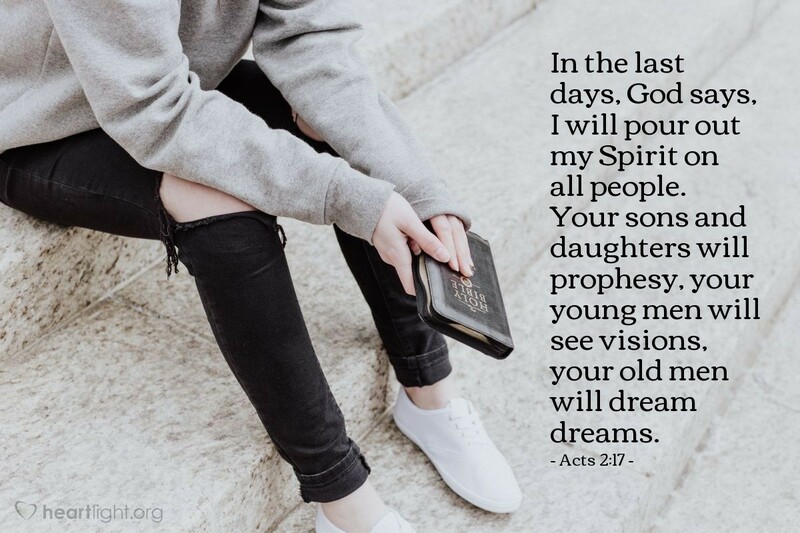 As those living in the last days, each believer — young and old, male and female — must be Spirit-led and Spirit-empowered to give his or her personal testimony to the grace of God given us in Jesus Christ. As Jesus prayed for us before his death (John 17:20-23), we must be united across the gender barriers and across the age barriers and across the racial barriers if the world is to truly know that God sent his Son as Savior of the world! God of all nations, please break down the barriers that divide us and that blunt the wonderful message of your grace. Pour out your Spirit upon us and convict us of our prejudice and selfishness, and replace it with your transcending love. Forgive us, forgive me, when my own shortsightedness and selfishness interferes with the world seeing a united Church proclaiming Jesus as Lord and Savior. In Jesus' name I pray. Amen.